Winter Riders...Are We The Brave Or The Stupid? Winter riding...do you? Or do you not? What ever your answer winter riding seems to generate a lot of debate. The longer I have been a biker I have sadly come to realise that the dream we sell ourselves, that bikers are all friends, well family really is simply not true. Although there is still thankfully a certain breed of biker for whom this standard still holds true this is not universal. There are many divisions. I have already discussed the problems of being CC Snobs(The BIG CC Question - Are You A CC Snob?) and herein lies yet another divide that some people like to get hot under the collar about. Some (I don't want to go about tarring everyone with the same brush here...so I repeat SOME) non winter riders seem to become very defensive when the subject of winter riding is raised. I find this rather curious. If one is happy with one's choices why become defensive or even rude about other peoples choices? For example I choose to wear a high viz vest. I will if asked be happy to talk to you why I made that choice but I would not call you an unsafe idiot if you yourself did not wear one. After all we are all adults and must stand by our own choices. However as soon as the dark and rain descends so does the seemingly touchy subject of Winter Riding. It can also bring forth some chilly comments from those who choose not to ride throughout the winter. To ride in the winter is stupid and dangerous. Riding is hazardous enough without taking on the dark and slippery leaves and wet roads. It is irresponsible to ride in the winter if you are a mother. Winter riders do not love their bikes as much as fair weather riders because they subject their motorbikes to salt. It is stupid to ride when you are cold. We fair-weather bikers have nothing to prove and are confident enough not to feel they have to "prove" anything by riding through the winter. What are all weather riders trying to prove by riding through the winter? Whaooh there...steady on chaps and chapesses. If fair weather riders are so happy with their choice not to ride all year round and feel they have nothing to prove then why the icy comments? I do not care if you ride a 125cc or a 1400cc. I do not care if you ride a 2 stoke or a inline 4. So I certainly do not care if you ride only in the summer. You ride that is all that matters. However I do not like to be treated with some weird contempt because I choose to ride throughout the winter. I do not consider myself an irresponsible mother who has a reckless lack of regard for her own life. I do not consider myself as stupid for choosing to ride all year. So let's have a closer look at some of those frosty remarks. It is true that riding throughout the winter months brings some additional challenges. Wet leaves etc are hazards but lets not pretend that hazards are limited to winter months only. After all I live in the UK and our summers do not consist of long hot days filled with endless sunshine and dry roads. It rains, rather a lot. Therefore wet weather riding is a skill we should all be sure to master. If you can ride through the rain of summer you can ride through the rain of winter. It is no more hazardous. In fact Summer can have its own special hazards. A light shower after days of dry weather can bring all the oil laid dormant on the roads to rise to the surface, creating a very slippery layer every bit as dangerous as leaves. If you never learn to master wet weather riding then you are more likely to be a danger to yourself and others when the day comes when you get caught out in the rain. A long hot summers day is not a "none dangerous" time to be out riding your bike. A hot day brings a lot of traffic onto the roads, making it far more busy than it would and on a dull grey winter's day. It also brings out the boy and girl racers. Dry roads bring greater speeds for some riders and these racers can prove very dangerous if their skills do not match their dreams. Their mistakes could cost both themselves and you dear. So lets not pretend that summer is one easy ride, it is not. It has its own particular set of dangers you have to be aware of and allow for. Just as winter has its own particular problems. With the advances in warm weather riding gear one really does not have to be too cold if you dress and layer yourself up correctly. Being too hot and dehydrated can also effect your riding during the summer. As for the salt, does it really melt our bikes before our very eyes? Ok I am not naive I know salt is not good for my motorcycle. However I accept this is a downfall and do my best to minimize the risk. I wash off the salt as soon as possible and I protect my bikes over the winter months by scrupulously covering them in protective sprays. It is time consuming, especially with two bikes. But it is the price I pay and accept gladly to keep getting my smile miles all year round. 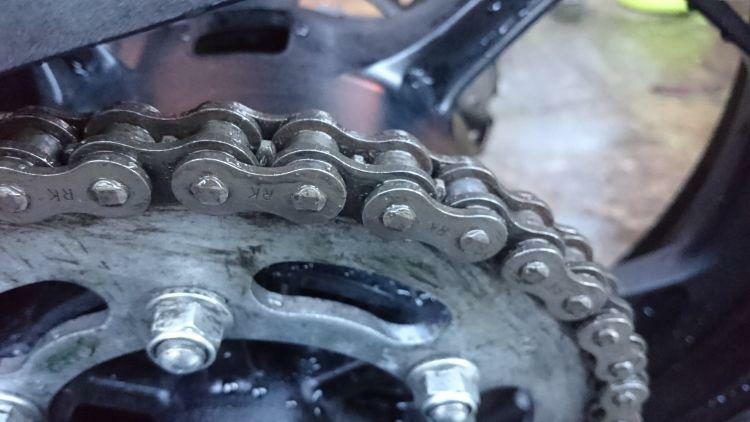 Kept well lubed chains can survive what winter throws at them. I ride throughout the year because I am lucky enough to choose to do so. I do not have to because I also own a car. I choose to because my bike is my freedom and my therapy. I could not stand to go for months without riding. I actually enjoy the quieter roads of winter. I can at times also relish the challenge of the wet roads and rocking and rolling in the wind. Some people get their thrills doing 120mph on dry tarmac. I find my thrill in riding through swirling leaves and finding my favourite spots and routes relatively deserted. Ok it is the UK nothing is deserted but less busy at least. So there is really no need for such negative comments from our fair weather friends. But maybe they are defensive because they themselves have been subject to bragging or negative comments directed at them by some all weather riders. Maybe they have been called soft or accused of lacking in confidence. After all are not some bullies born from those bullied themselves? Who knows? But lets us all try and be kinder to each other and accept we all do and like different aspects of riding. We do not all have to be the same, it would be dull and boring if we were. so lets embrace those differences if we can. Lets us not only ride what we like but also ride it when we like. Due to the commute to work I have to ride in the winter on most days. It's around a 10 Mile journey each way. My other vehicle is a push bike and with having strained ligaments in my knee not an option for about six weeks. By which time the worst of the winter will have passed. I quite enjoy the ride to work but leave early when setting off for work to allow plenty of time to have a leisurely bimble down the road. I ride at my own pace and at speeds suited to the conditions. When I arrive home it's a case filling up a watering can and washing off any salt deposited on bike. Then drying it off thoroughly. Once a week I give the bike a spray with FS365 and cover exposed bolts with lithium grease. I've heard good and bad things about ACF50 but as I have never used it need to reserve judgement on it. The chain is cleaned every 3-4 days depending on state. Checked and adjusted more frequently. I have been looking into heated grips but I have not found it cold enough yet to merit them. Although I'm the type who does believe it's particularly cold until it's about minus 10 etc. I have a 25 mile commute to work twice a week and I too like to leave in plenty of time. It seems all the other road users are in such a rush and I can just meander along safe in the knowledge time is on my side. I get to work early? So what, have a brew, chill out and relax before making a start. I have to admit though I'm not so good at hosing the bike down when I get home. As for the cold again having a little time in hand helps. If my fingers are no longer functioning and my feet are cold I can pull up and have a few minutes stretching and wiggling my extremities to get the blood flowing. Strangely after doing this the cold seems not to return with the same vengeance. I know a lot of folks swear by heated grips. When I tried them I found I had sweaty palms but still frozen fingers. Maybe I was doing it wrong. Nice to read a sensible article about winter riding. As a motorcycle courier who doesn't own a car, I spend a lot of the winter on the road and often think it's quite a different skill set to riding in the summer. I hate handlebar muffs with a passion but for the really filthy days I always come back to the combination of heated grips, handlebar muffs, a full set of "bin man" waterproofs and some fleecy layers. Keep riding and keep safe, however you chose to do it! Which Suzuki is "melting before your eyes" Chris? Ahhh your bike is melting, nooooo! I am curious if you use any protective sprays on your bike? as I have just completed another article about how I personally think these sprays help. I ride a 66 mile commute everyday. .also do shift work so sometimes start at 2am and sometimes finish at 2am...I Have an old kawasaki 550gt which I try to keep mechanical sound. I'm not to bothered how it looks .I wash it when I can and my kit is mostly second hand bought of weekend warriors who hardly wear it in before buying the latest kit...I don't see why you wouldn't ride all year round I can't stand sitting in traffic. ..you look at these sad little faces sitting in a tin box day in day out stuck in the same traffic ...and they think I'm mad..so its a bit cold and wet ..you only get wet once. ..I've always thought the real bikers are the riders clonking to work on beat up old MZs that I used to see as a kid...my good lady rides all year to...doesn't matter what you ride as long as you ride! I think there is a difference between commuting and a weekend day ride out in the winter months, if you commute it will be dark either in the morning or evening when you finish or both. The commute is by far the most dangerous ride because people are quite simply in a rush if they happen to be late for work. I myself have had a few moments where car drivers had not seen me, I guess my single headlamp just gets lost amongst all the other cars headlights. I have also had a couple of offs on wet or icy or salt laden roads when one of the wheels lost traction, I have also unfortunately lost a couple of friends forever who were sadly killed riding to work in winter, so I made the decision that driving to work in the dark months is best for me, besides the car I drive is actually cheaper to run than any of my bikes, and still looks great after I give it a wash, whereas my beautiful bike would inevitably suffer the worst after a salt bath no matter how much I sprayed it with whatever is on the market. If you think this sounds like a wimp then can I tell you I have rode motorbikes throughout the year for 36 years and I'm afraid that common sense has prevailed in this case, but if any one of you lot want to do it then you have my admiration, hurry up spring! I just ride when I feel like it, the time of year doesn't sway my decision. I ride a cruiser and went to a local cafe just before Christmas and there were only three other bikes there, all adventure bikes and one guy said to me "I thought you cruiser blokes didn't ride in the winter". I don't understand why people make assumptions, ride in the winter if you want to, don't ride if you don't want to. Simple really, great site by the way. I'm a newbie when it comes to motorcycling having only contracted 'the bug' in my late 30s, so perhaps don't have the same reservations as more experienced riders. I took my CBT on 23rd December and took my new Duke 125 for his first spin on the 24th, so very new to the game! having purchased it 75% for commute and 25% for fun, I was always likely to be an all year rider. As with many other comments, the key in winter is patience. Easy for me to say as the 'novelty' has yet to wear off. whilst you can't mitigate all risks, your attitude on the road is something you most certainly can control. So leave a bit more space, take that corner a little slower, don't 'force' your way through traffic...sit back and relax. You'll still get there much quicker than bus / train / car. Note, I say all of this having come off the bike on my CBT (too much front brake in very wet conditions), so am more than aware of my vunerablity in unfavourable conditions. My response was to dust myself down and resolve to learn from my mistakes. I have an enormous amount of respect for the motorcycle, but no fear. I can't wait until spring; the days will be longer and I'll (hopefully) be more a experienced / competent rider. In the meantime however, I'll still be enjoying the buzz! I can't agree more about keeping the speed down and creating as much space around you as you can KD. I don't know where you live but if it's cold out there beware how much the cold can sap that all important concentration. Sharon and I look like two big fat sumo wrestlers by the time we've donned layer upon layer thermals, jumpers, jackets, overjackets and waterproofs. I like your thinking of "I just ride when I feel like it" as you say it really is that simple :-). Absolutely. I'm in the fortunate position of not needing to commute so I can choose my times and places. I must say I prefer riding during the week (outside "rush" hours) as there are so many incompetents out and about at weekends. I can't understand people sometimes, it's like Youtube, if you like it watch it,if you don't, move on,but that doesn't mean you have to slate the video before leaving,it's your choice and you, like Ren, are admired for doing it. I retired 3yrs ago through ill health(more like ground down by a certain communications company) at 52 and don't commute either, I agree with Ian Sody, but after not travelling in peak times or through busy towns regularly until recently, (Hospital visiting), it felt like the Bumping cars lol,it's surprising what we get used to maybe, my car felt older and annoying to be in too.Just give me emptier country lanes any day. I keep on thinking winter is coming to an end then the weather turns and reminds me we're not there yet. Chris I think people rarely just scroll by if the subject is emotive enough. I suspect many motorcyclists feel like winter riders are mocking them for being lightweights or fairweather riders. This challenges either their macho image, their commitment to motorcycling or their abilities on two wheels. It's an ego thing. Of course the winter riders play on this which makes us bullies with equally fragile egos. Do we REALLY believe shivering and slithering down salt laden roads that ruin our motorcycles helps us become a better rider? Do we REALLY need to tell everyone about our horrific journey to prove how tough we are and demonstrate we a REAL bikers? I think the truth lies somewhere in the middle. Winter riding does improve our skills but it's not essential. The rest is just argument for ego's sake. As for traffic! When I am king of the world the only people allowed on the roads will be myself and whoever I choose to ride with. So far my plans to become king of the world are not going very well. RE last comment, by "doing it " I mean bad weather riding ,not slating videos lol,you know what I mean. Writing about how bad the ride was does give us procrastinators some thing to do. Ian I would love for you to write up all those tales and send them to me. I'll create a "Soady's Memories" section. "However as soon as the dark and rain descends so does the seemingly touchy subject of Winter Riding. It can also bring forth some chilly comments from those who choose not to ride throughout the winter". People who talk like this don't belong anywhere near a bike in the first place. They should stay in the car where they belong if they're so bloody frightened. Biking has unique hazards whatever time of year you ride. Two years ago in Spring on a lovely sunny afternoon I got taken down by a deer. It came from out of an Ibis hotel car park of all places, and rammed into the side of me as I was slowing down for the lights. Just laying their with 250kg of BMW R1100 on top of me, unable to move calling for help. I was amazed a the amount of people both in vehicles and on foot who just looked at me and carried on about their business. A few years before that, again in the Spring on a warm barmy evening I ran over a badger. It just came out of a hedge and ran under me wheels. Don't know if you've ever done that but it's like going over a big rock. Lord knows how I stayed on, but I did. I was riding along a lovely straight country road in Sussex, beautiful day, no junctions, no other traffic, just me cruising at about 60mph when a pheasant flew out of the hedge straight into my lap. They look pretty harmless and cute when they're walking about don't they. Believe me when you've got one flapping around in your face, they're not so nice. By the time I did get rid of it, I was on the wrong side of the road. Luckily there was nothing coming. My point is that all these things happened to me in the so called "biking season"
I have never, in 35 years ever had an incident in the Winter, despite riding all year round all my adult life. It's not an ego thing. I don't do it to prove a point. I do it because I love riding my bikes, and I especially love Winter riding. Yeah I know, that's probably a bit weird, but hey ho.